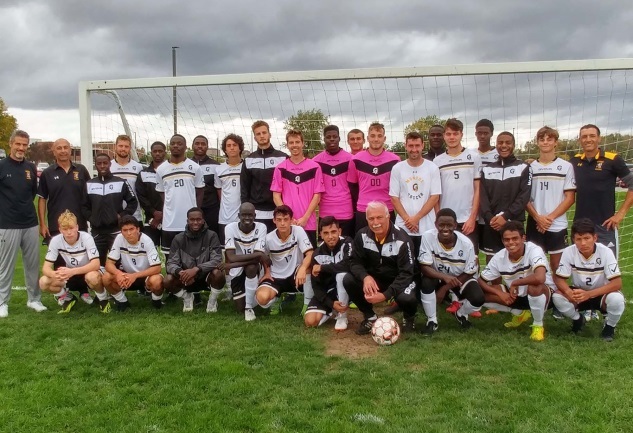 ROCHESTER – The MCC men’s soccer team shut out the St. John Fisher College JVs 7-0 on Saturday, and in the process gave longtime head coach Nelson Cupello a landmark victory. The win was the 365th of Cupello’s career, which moves him into sole possession of first place on the all-time MCC men’s soccer list. He passes legendary coach Joe Mancarella to take over the top spot. Cupello and Mancarella are the only two head coaches in MCC men’s soccer history. Isaiah Lee had a hat trick in the opening 45 minutes as Monroe took a 5-0 lead into the break. The Tribune defense made the lead stand up, as a trio of MCC keepers did not have to make a save on the game. Lee opened the scoring in the 14th minute as he redirected a beautiful cross from Jacques Aristhenes into the goal for a 1-0 lead. Jordan Sullivan then followed with a score in the 19th minute to make it 2-0. Lee’s second goal came off a Cameron Welling feed in the 27th minute. Welling found the back of the net himself a minute later, deftly picking off a pass from the Cardinal keeper and putting it past him to make it 4-0. Lee then finished off his efforts in the 39th minute off a pass from Sullivan. Anthony Short and Connor Simpson tacked on goals in the second half for the Tribunes, who have now won five straight games.